Does Everything Move at the Speed of Light? I have a friend who once explained to me his way of understanding spacetime, and what Einstein discovered about it, which was to start with the idea that, as he put it, “everything is traveling at c,” and proceed from there. Light travels at c, of course, but time does not pass for light, forming vector AG, shown in purple. A spatially-stationary rock is still traveling — temporally, into the future, at a rate of sixty seconds per minute, as represented by dark green vector AN. My friend’s idea was to interpret this rate of time-passage — the normal time passage-rate we generally experience — as another form of c. Sublight moving objects are moving at c, according to this idea, as a vector sum of temporal and spatial velocities. In this diagram, all spatial dimensions are collapsed into one direction (parallel to the x-axis), while time runs up (never down) the y-axis, into the future (never the past). In the diagram at the top of this post, the blue horizontal component-vector NM represents a spatial velocity of (c)sin(10º) = 0.173648c. It is a component of the total velocity of the object represented by blue vector AM, which is, if my friend is correct, is c, as a vector-sum total velocity — the sum, that is, of temporal and spatial velocities. 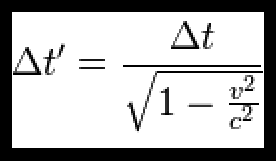 By the equation shown above, then, the measured elapsed time for an event — say, the “minute,” in “seconds per minute” — to take place, at an object with that speed, as measured by a stationary observer, should be 1/sqrt[1-(0.173648)²] = 1/sqrt(1 – 0.0301537) = 1/sqrt(0.969846) = 1/0.984808 = 1.01543 times as long as the duration of the same event, for the observer, with the event happening at the observer’s location. Now, if time is taking longer to pass by, then an object’s temporal speed is shrinking, so this slightly longer elapsed time corresponds to a slightly slower temporal speed. As seen in the equations above, near the end of the calculation, the two have a reciprocal relationship, so such an object’s temporal speed would only be 0.984808(temporal c) = 0.984808(60 seconds/minute) = 59.0885 seconds per minute. Therefore, an object moving spatially at 0.173648c would experience time at 0.984808k, where k represents the temporal-only c of exactly 60 seconds per minute — according to Einstein. Next, to check this against my friend’s “everything moves at c” idea, I need only compare 0.984808 to the cosine of 10º, since, in the diagram above, based on his idea, vector BM = (vector AM)cos(10º). The cosine of 10º = 0.984808, which supports my friend’s hypothesis. It has therefore just passed its first test. 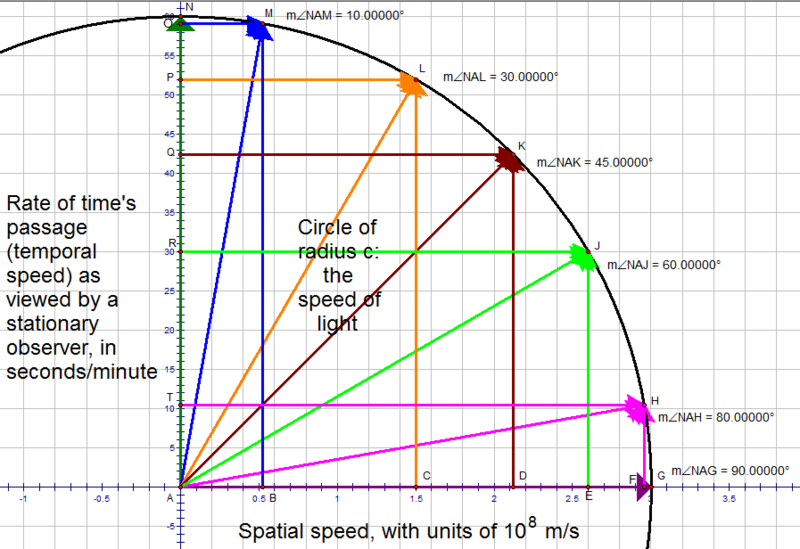 As for the other sets of vectors in the diagram, they provide opportunities for additional testing at specific relativistic spatial velocities, but I’m going to skip ahead to a generalized solution which works for any spatial velocity from zero to c, corresponding to angles in the diagram from zero to ninety degrees. Substituting θ for 10º, the spatial velocity, (c)sin(10º), becomes simply (c)sinθ, which corresponds to a temporal velocity of (c)cosθ, with it then necessary to show that the “cosθ” portion of this expression is equivalent to the reciprocal of 1/sqrt[1 -(sinθ)²], after the cancellation of c² in the numerator and denominator of the fraction, under the radical, in the denominator of Einstein’s equation for time dilation. By substitution, using the Pythagorean trigonometric identity 1 = (sinθ)² + (cosθ)², rearranged as 1 – (sinθ)² = (cosθ)², the expression 1/sqrt[1 -(sinθ)²] = 1/sqrt[(cosθ)²] = 1/cosθ, the reciprocal of which, is, indeed, cosθ, which is what needed to be shown for a generalized solution. My friend’s name is James Andrew Lemley. When I started writing this post (after the long process of preparing the diagram), I did not know what result I would get, comparing what logically follows from Andrew’s idea with the well-tested conclusions of Einstein’s time-dilation formula, at even one specific relativistic speed. Andrew, I salute you, and think this this looks quite promising. Based on the calculations above, and after all these years, I must tell you that I now think you are, indeed, correct: in a sense that allows us to better understand spacetime, we are all moving at c.
I made this with Stella 4d, software you can try for free here. I told Jynx that I did not need his “help,” since I already know how to grade papers; I even told him that I very much needed not to have his “help.” Jynx did not care. Papers were there, and he was determined to grade them. 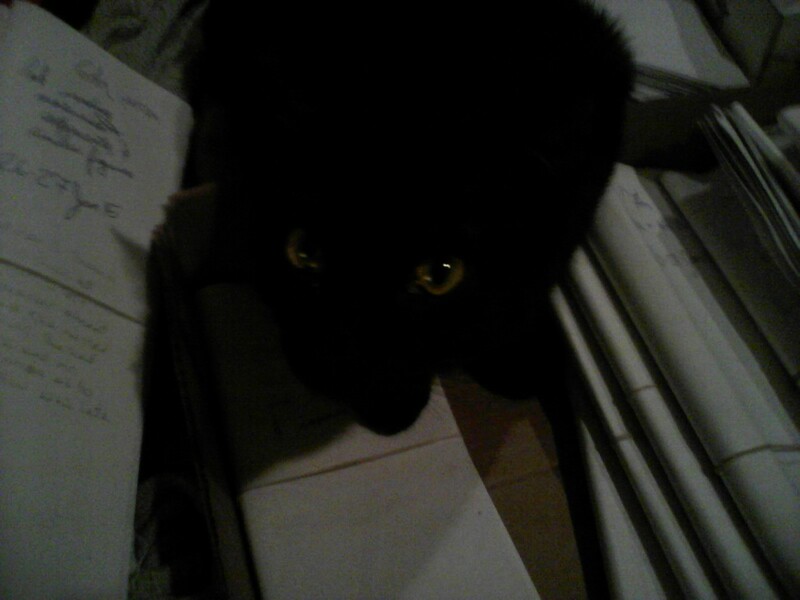 The only problem (for Jynx) was that, before Spring Break even began, I had sorted all the papers to be graded, folded each set separately, and fastened each bundle shut with a separate rubber band, simply to organize the papers to be graded. Some of us in education call this sorting-process “pre-grading,” or something like that. Jynx didn’t like it, though, for the rubber bands kept him from getting to the papers he so desperately wanted to grade (or eat, or shred, or something). He could, of course, get to the rubber bands, for they were on the outside of each of the bundles of papers. He has claws to pluck them, and did so. He also started trying to pull off the rubber bands with his teeth. Each time a rubber band got plucked, by tooth or claw, twang! Different rubber bands on different bundles were stretched with varying tensions, producing rubber-band-twanging sounds of varying frequency. In other words: Jynx played different musical notes. Soon, Jynx had forgotten all about grading papers, and was simply having fun playing music for the first time. He was delighted to be playing music . . . or frustrated that he couldn’t get the bundles open . . . or possibly both. I had also forgotten all about grading papers, and simply sat, listening in amazement, for I’ve had cats all my life, and, aside from the familiar “cat on a piano” song many people have heard, I have never before heard a cat, nor a kitten, attempt to play music. Jynx’s improvisational rubber-band piece started to improve rapidly with practice, and soon Jynx’s music was much better than even the best-rendered version of “cat on a piano” I have ever heard before — and he’s still a kitten! Unfortunately, I was not able to open software to record Jynx’s music in time, before he moved on to other things, as kittens do fairly often. As a result, only my wife and I know what Jynx’s music actually sounds like. I did manage to snap the picture above, of him looking up at me from his “musical instruments,” before he moved on to the next of his hijinks for the day, of which there are always many. And, now that Jynx has decided it’s nap time, I’ll get back to grading these papers. It just occurred to me that there are an absurd number of common phobias, such as claustrophobia or acrophobia, for which I have the polar opposite — an unusual attraction to the commonly-feared thing or situation. (Since I am no stranger to anxiety, so this is rather odd.) Claustrophobics fear enclosed spaces, while those with acrophobia fear heights. If someone told me that a sensory deprivation tank was available for my use, atop the nearest mountain, I’d drive straight there, climb the mountain, get in the tank, and seal myself in for hours, for two reasons: I love being in enclosed spaces, and also absolutely love heights. Combining the two would be awesome! There is a proper word-ending for the opposite of a phobia, of course: “-philia.” Unfortunately, though, use of words which end with -philia is problematic, due to the fact that the most often-used words with this ending refer to criminal acts. There’s nothing wrong with the words “claustrophilia,” nor “acrophilia,” to a linguistic purist. To a pragmatist, though — which I am — the undesirable effect of reminding the reader of such horrors as pedophilia must be taken into account. For this reason, I find it preferable to state that I have the opposite of both claustrophobia, and acrophobia. Acrophobia, fear of heights — See first paragraph, above. Aerophobia, fear of flying — Just being a passenger on an airplane is thrilling, especially at take-off. Once, at about age twelve, I actually got to take the controls of a small plane for a little while, and that will remain one of the peak experiences of my life. Ailurophobia, fear of cats — We have cats, and I’ve had cats all my life. I admire their “cattitudes,” for one thing; they are somewhat like my own. Arachnophobia, the fear of spiders — I try my best to protect every spider I see, wear a spider necklace, have a spider tattoo, and have spider-decorations in my classroom year-round, just because I like spiders that much. Atychiphobia, fear of failure — If I had this, I would never begin work on any challenging math problem, and . . . well, what would be the point of existing like that? Autophobia, fear of being alone — The fact that I traveled over 11,000 km, alone, in my late teens, proves I don’t have this problem. Barophobia, fear of gravity — A bad idea for anyone with mass! If I had it, I wouldn’t be writing this, for I’d be too busy freaking out. All. The. Time. Bibliophobia, fear of books — Yeah, well, I can’t even narrow down my favorite-author list to fewer than four, as seen here. Claustrophobia, fear of enclosed spaces — See first paragraph, above. 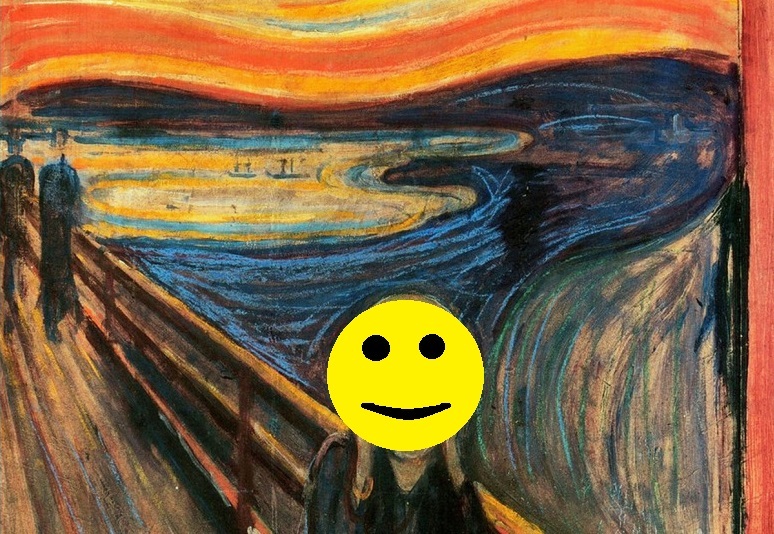 Cyberphobia, fear of computers — Wow, that would make it difficult to maintain a blog! Glossophobia, fear of speaking in public — As a teacher, I actually get paid to run my mouth, so this one is . . . out! Gynophobia, fear of women — They may scare a lot of lawmakers, judging from the political “war against women” in America, but I’ve always preferred the company of women to that of men (sorry, guys). Islamophobia, fear/hatred of Muslims and Islam — I’ve blogged about this; you can find those posts here. Melanophobia, fear of the color black — My favorite color! Negrophobia, fear of Black people — It’s a common affliction where I live, this being the American South, but I couldn’t do my job if I had this problem, for a majority of my students are Black. I can’t think of any reason why a person’s albedo, high or low, should be a problem for me. I’m not allergic to melanin, after all, and have viewed racism as evil since I first became aware of it, as a child. Nyctophobia, fear of darkness and night — If I could get away with it, I would be completely nocturnal. Ombrophobia, fear of rain — I don’t even own an umbrella. Ophidiophobia, fear of snakes — Have you ever had a twenty-minute stand-off with a copperhead? I have. I was probably fifteen or so at the time. My reasoning: running toward or away from the snake might be dangerous, and walking away wasn’t an option, since I was standing on a rock in the middle of a river, with the snake on the next rock — so I held my ground, and simply stayed on “my” rock. The snake did the same on his rock, for about twenty minutes, and then it jumped into a river and swam away, ending the standoff. This wouldn’t have been possible with ophidiophobia. Triskaidekaphobia, fear of the number thirteen — Why would anyone fear a number, especially one of the smaller primes? Wouldn’t that mean not being able to count more than a dozen things at once? There’s plenty of evidence on this blog that numbers don’t scare me. The next time anxiety is a problem for me, I’ll try to remember to think about this list of anxiety-problems I don’t have, but which do affect many other people. I could certainly have it worse when it comes to anxiety, and it harms nothing to keep that in mind. In fact, it might even help. I was recently diagnosed with sleep apnea. As a result, I now have a CPAP machine, on me and running, for the first time at home. The headgear reminds me of the uniform Alex Summers wears, as Havok of the X-Men, except that his nose isn’t covered, as mine is. I also have shown no ability to focus the energy from cosmic rays at targets of my choice, or anything remotely like that . . . at least not yet. Others seem to think I look a tad more ridiculous, however. As far as how I sound, I literally have to keep my big mouth shut for this thing to work, so my wife (without whose help I couldn’t have gotten into this contraption) always gets the last word now. (Also last snicker, etc., as she just pointed out to me, happy that she can talk, without risk of interruption, for a change.) 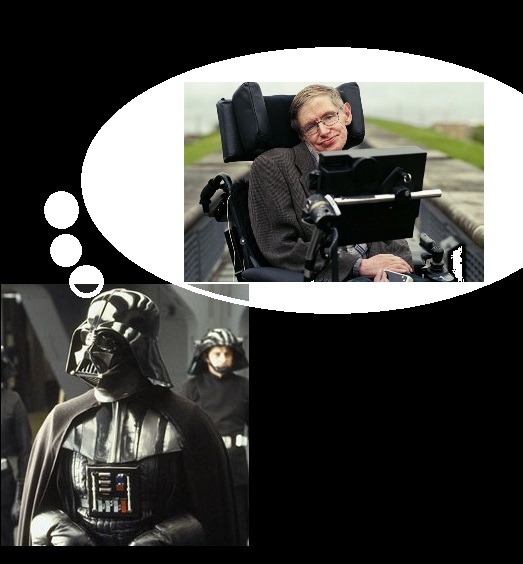 As she was putting it on, though, I talked as much as I could, until she reminded me that I’m not supposed to talk while, um, “CPAPping.” However, my last bit of chatter for the night sounded like Darth Vader doing an impersonation of Stephen Hawking. This is the rhombic dodecahedron, the dual of the Archimedean cuboctahedron. While the rhombic dodecahedron has 12 faces, there are many other polyhedra made entirely out of rhombi, and most of them have more than twelve faces. An example is the rhombic enneacontahedron, which has two face-types: sixty wide rhombi, and thirty narrow ones. It is one of several possible zonohedrified dodecahedra. As the next figure shows, the wide rhombi of the rhombic enneacontahedron have exactly the same shape as the rhombic dodecahedron’s faces, so the two polyhedra can be stuck together (augmented) at those faces. These wide rhombi have diagonals with lengths in a ratio of one to the square root of two. The next picture shows what happens if you take one central rhombic enneacontahedron, and augment all sixty of its wide faces with rhombic dodecahedra. Since this polyhedral cluster in non-convex, it can be changed by creating its convex hull, which can the thought of as pulling a rubber sheet tightly around the entire polyhedron. Here’s the convex hull of the augmented polyhedron above. The program I use to make these rotating images, Stella 4d (which you can try here), has a function called “try to make faces regular.” If applied to the convex hull above, this function leaves the triangles and pentagon regular, and makes the octagons regular as well. However, the rhombi become kites. The rectangles merely change, getting slightly longer, while rotating 90º, but they do remain rectangles. Once more, I applied the “try to make faces regular” function. This polyhedron has five-valent vertices where the shorter edges of the kites meet. These are also the vertices of pentagonal pyramids which use kite-diagonals as base edges. By using faceting (the inverse operation of stellation), I next removed these pyramids, exposing their regular pentagonal faces. For the sake of comparison, here is a similar polyhedron (included in Stella 4d‘s enormous, built-in library of polyhedra) which is recognized as a near-miss to the Johnson solids. (I do not know the name of the person who discovered it, or I would include it here — I only know it wasn’t me.) It’s called the “half-truncated truncated icosahedron,” and its longest ledges are just over 7% longer than its shorter edges, with the non-regularity of faces also limited to isosceles triangles. However, this irregularity appears in all of the triangles in the polyhedron below — and in the “near near-miss above,” the irregularity only appeared in some of the triangular faces. Polyhedra are one of the areas (there are at least a few others) where the fields of mathematics and art intersect. Stella 4d, the program I used to make this image, is a great tool for the exploration of this region of intersection. This software may be tried for free right here.